Find books written by the Bamontes online at www.tornadocreekpublications.com. 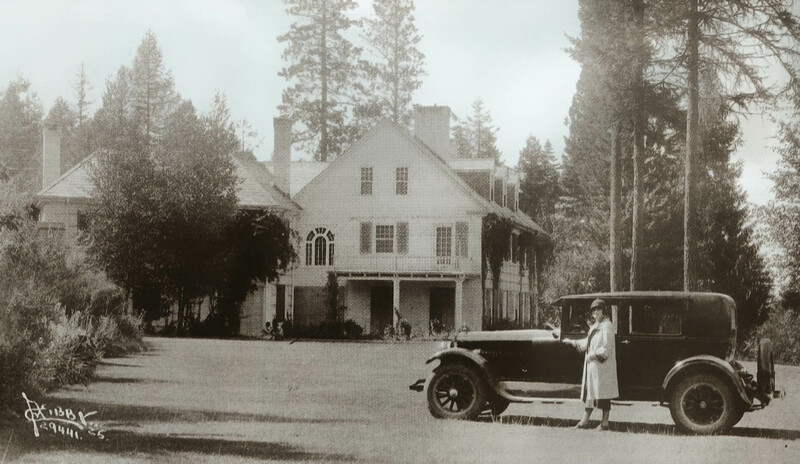 Above, a 1925 Hudson on the lawn of the F. Lewis Clark house at Hayden Lake. The photo was taken for car dealer John Doran Co. Photo courtesy of Tony and Suzanne Bamonte. Hayden Lake has long been a popular gathering place. Before the arrival of the white man, local native tribes congregated there to partake in the bounty of the area. After the military constructed Fort Sherman on the shores of Coeur d’Alene Lake in 1878, some of the first settlers at nearby Hayden Lake were soldiers from the fort. The lake was named for one of these soldiers, Matthew Hayden. In 1902 a summer hotel called Avondale Cottage was opened to the public at Hayden Lake. Although it was an enticing place to enjoy the hot summer months, the lack of transportation to the lake limited the number of visitors. But this was a time of rapid expansion and development in the Inland Northwest and the electric railroad line, built in 1903 to shuttle back and forth between Coeur d’Alene and Spokane, was soon extended to Hayden Lake. Entrepreneurs involved with the railroad realized the potential of increased passenger traffic by establishing a first-class resort at the lake as a destination spot. 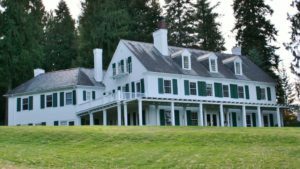 Spokane architect Kirtland K. Cutter designed the resort, called the Bozanta Tavern (now the Hayden Lake Country Club). The Olmsted Brothers from Massachusetts, one of the nation’s most sought after landscape architectural firms, created the landscape design. The resort opened in 1907 and was soon attracting enough visitors to warrant hourly trains. With all the features and amenities the resort offered, it attracted the patronage of many of the area’s wealthy social elite. Among those drawn to the area were E Lewis and Winifred Clark, who built a palatial mansion they named Honeysuckle Lodge. Visitors to the Clarks’ home often arrived on the electric line and were shuttled across the lake in Lewis’s private yacht. When the Clarks built this 15,000-square-foot private lodge at Hayden Lake in 1910, it was of the finest materials and with great attention to detail. For a few short years, it provided a glorious setting for elaborate parties and other gatherings. In the ensuing years, it served in various capacities, some of which included a boys’ home, convalescent center for patients from Farragut Naval Hospital, a resort and a restaurant. Time was not kind to this immense house, partially due to the financial burden to maintain it. During periods of vacancy, vandals and thieves were brutal in their disrespectful treatment of the grand structure. As time passed and the lodge became neglected, memories of its past also began to fade. The “honeysuckle days” were gone and it became known simply as “the Clark House.” After sitting vacant for 20 years, in 1988 the Kootenai County Fire Department scheduled the building to be used as a burn exercise. To see the house today, it’s alarming to realize how close this region came to losing such a grand piece of its history. In 1989, Monty Danner, a corporate executive from California, was looking to invest in a corporate getaway. He was about to close a deal on some property in Florida when he received a call from Mark, the eldest of his three sons. Mark was extremely excited about a house on Hayden Lake that Monty “had to see.” Monty headed to the Inland Northwest at Mark’s behest and was shocked to be shown an extremely dilapidated structure; Herculean efforts would be required to restore it to some semblance of its former incarnation. Monty’s reaction was a resounding “No!” However, able to see beyond the present appearance, Mark persisted. As Monty tells the story, after a supper of sandwiches and a bottle of wine on the lawn, the old house began to look a little better. 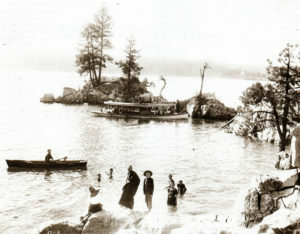 Bathing at Lee’s Point, Hayden Lake, circa 1910. Photo courtesy of Tony and Suzanne Bamonte. 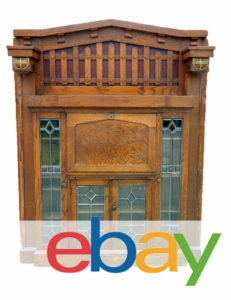 The short version of the story is that Monty bought and restored the house. Although his restoration of this Idaho gem is now met with enthusiastic responses, it wasn’t always so. He began this project at a time when an insidious attitude treated “California transplants” as intruders treading on sacred ground. However, as they got to know Monty and see the transformation in the house, it wasn’t long before skeptics became supporters. Danner and his business associate, Rod Palmer, along with the assistance of Monty’s sons, orchestrated an incredible rescue mission on the house. Most of what could be stolen from the house had been, and nearly everything else damaged or broken. The restoration involved replacing thousands of windowpanes, installing heating and electrical systems, salvaging hardwood floors, and the list goes on. In addition to now being fully functioning, the house has been exquisitely adorned. Hand-painted murals throughout the interior are visual delights. The murals were a gift from talented, Canadian-born scenic artist and interior and set designer, Jack McCullagh. A captivating mural in the, dining room depicts scenes from the history of the house from its construction to near demise to restoration. Having learned about the project Danner had undertaken, McCullagh offered to paint murals for the house as a gift if given carte blanche to express his feelings toward the spirit of the house. The murals alone are worth a trip to the Clark House. 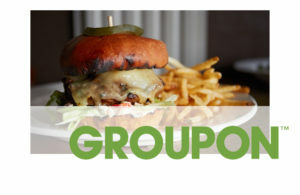 In addition, the decor is tastefully done and provides a warm and inviting environment. The restoration alone was certainly enough of a project, but to Monty’s credit, he absorbed himself in the history of the house and its original owners, compiling what is probably the most complete history in existence about F. Lewis and Winifred Clark. He also documented and preserved the home’s present history, that of the restoration, which is kept in the Clark House library for interested visitors. We have been blessed to have spent the night in Clark house a couple of times when it was a bed and breakfast. It is absolutely beautiful and the murals amazing. We also had meals in their small dining room and the food was excellent. Thank you, Clark House, for the wonderful memories. I would like to purchase 2 copies of the Bathing at Lee’s Point, Hayden Lake, circa 1910. Is that possible? I am 66 years of age. I played piano for family dinners when I was 13 at the Clark House. Thank you Monte.